Shalin Shah was a recent college graduate and new Peace Corps volunteer when doctors discovered a rare form of cancer in his brain. Roughly half a year later, doctors came into his hospital room with the devastating news that he had just six to nine months left to live. At the writing of this story, that prognosis is down to one week. Throughout the physical and emotional ordeal, his loved ones say that Shah has demonstrated a profound resilience and peace of mind. The 22-year-old has tried to live every single day as fully as possible, including by marrying his high school sweetheart, Frances Chen. Now the two want to share his hard-won wisdom with the world. Born and raised in San Diego, Shah graduated from the University of Southern California in May 2014. He then shipped off to Peru to begin two years of service as an economic development volunteer with the Peace Corps. During his training in Peru, Shah developed a cough and was having difficulty breathing and severe rib pain, Chen said. Peace Corps doctors eventually found a six-inch mass in his chest cavity. In August, Shah was evacuated to the Ronald Reagan UCLA Medical Center, where he underwent 21 days of biopsies and emergency surgeries. Following these tests, the doctors diagnosed him with stage IV synovial sarcoma — a rare cancer stemming from genetic mutation — with brain, lung and spinal cord metastasis. He was “in shock,” Chen said, and had lost over 50 pounds since the beginning of the summer. By December, the cancer had spread to his lungs, bones and spinal cord. On Feb. 5, 2015, an MRI scan revealed more than 30 inoperable brain tumors. He was given six to nine months to live. Shah decided to get to work on his bucket list. Life had already offered him so many extraordinary opportunities, Shah wrote. He had lived in Paris for a semester, found his true love and graduated from college. Shah had always wanted to go to Coachella, Chen said, but when she checked in early February, tickets had been sold out. Chen sent an email to the music and art festival’s general inquiries address and was blown away by the response. Festival co-founder Bill Fold personally emailed them to offer the couple a free VIP pass. When Shah and Chen arrived, staff at Goldenvoice, an organization that does concert promotion for music festivals, surprised them with luxury yurt accommodations operated by CID Entertainment, spa vouchers, catering passes and artist wristbands that got them backstage at any show. 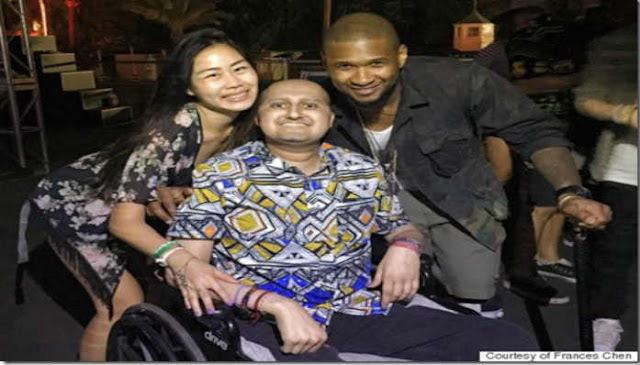 Most notably, Shah was able to meet his musical hero, Usher, as well as the Black Eyed Peas. Shortly after returning from the festival, Shah and Chen were married in a sunset ceremony in Dana Point, California. They tied the knot on April 24, just a few months after their five-year anniversary. “Of course, we capped off the night with an epic dance party to a playlist heavily featuring Shalin’s longtime musical idol, Usher,” Chen said. One thing was still missing, though. Shah had remained in close contact with Peace Corps staff in Peru, sending them emails of encouragement and support from afar. At the time he left the program in August 2014, he had just one week of training to go before being sworn in as an official volunteer. Peace Corps Director Carrie Hessler-Radelet was visiting Peru in April when she heard Shah’s story. Inspired by his bravery and dedication, she made a stop in Los Angeles to meet Shah and swear him in as an official Peace Corps volunteer. Last week, Shah went into the medical center for a routine round of chemotherapy. A day into the treatment, he began having extreme difficulty in breathing and one of his hands started to go numb, Chen told HuffPost. Doctors told them that given Shah’s high heart rate and breathing troubles, he had roughly a week left to live. “All of our goals are just to make him comfortable,” his wife said. Chen said she is keeping herself busy and focusing on her husband’s needs in order to get through this hard time. “I just want to stay strong for him,” she added. Shah’s own optimistic attitude has helped his family find their strength, said his cousin Aditi Joshi. I’m going to carry this for the rest of my life,” Joshi added. There is no such thing as better, only better suited.